Four-time Presidents Cup Captain Jack Nicklaus was on hand today for the announcement that Nick Price and Jay Haas have been named the International and US team captains, respectively, for The Presidents Cup 2015 being played at the Jack Nicklaus Golf Club Korea. Pictured left to right are Gary Player, Korean star and Vice Captain KJ Choi, Nick Price, Jay Haas, Jack, and PGA Tour Commissioner Tim Finchem. Ridgedale, Mo. — At a press conference today at the inaugural Big Cedar Lodge Legends of Golf presented by Bass Pro Shops, PGA TOUR Commissioner Tim Finchem introduced Nick Price and Jay Haas as captains of the International and U.S. Teams, respectively, for The Presidents Cup 2015 being played at the Jack Nicklaus Golf Club Korea in Songdo IBD, Incheon City, South Korea. Price, captain of the International Team in 2013 and a World Golf Hall of Famer, joined Finchem for the announcement, as did Haas, a three-time U.S. Team captain’s assistant; both players are past Presidents Cup participants and both are competing in this week’s Champions Tour event at Top of the Rock. Also attending the press conference to lend perspective on The Presidents Cup and support of this next chapter in the event’s history were Jack Nicklaus, a four-time U.S. Team captain, and fellow World Golf Hall of Famer Gary Player, an International Team captain three times. Nicklaus and Player are also in the Big Cedar Lodge Legends of Golf field, and the Golden Bear was the designer of both the Presidents Cup venues for 2013 (Muirfield Village Golf Club) and 2015. 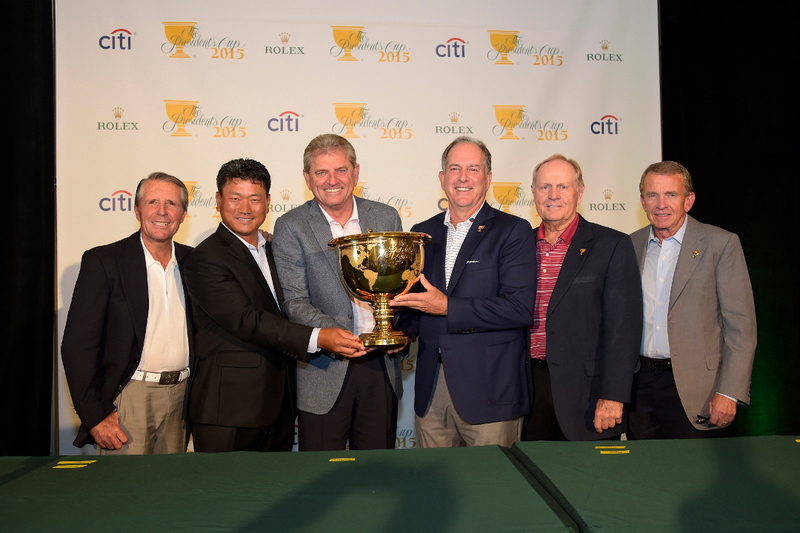 The Presidents Cup 2015 will be held Oct. 6–11 when the biennial competition makes its first trip to Asia. Jack Nicklaus Golf Club Korea will be the fourth international venue to host The Presidents Cup, joining The Royal Melbourne Golf Club in Melbourne, Victoria, Australia (1998, 2011); The Links at Fancourt, George, South Africa (2003); and The Royal Montreal Golf Club in Montreal, Quebec, Canada (2007). Immediately upon being unveiled as The Presidents Cup 2015 captains, Price and Haas each named one of their captain’s assistants. Price invited South Korea’s K.J. Choi to join his team’s leadership, and, in a nod to the significance of The Presidents Cup being played in Asia for the first time, Choi was given an elevated title of vice-captain. Haas essentially “traded places” with World Golf Hall of Famer Fred Couples, asking his good friend and three-time U.S. Team captain to assist him in 2015. Choi attended today’s announcement; Couples was scheduled to attend but withdrew from the Big Cedar Lodge Legends of Golf due to a back injury. Price and Haas will announce their additional captain’s assistants (up to three, total) later this year. An 18-time winner on the PGA TOUR, including three major championships, Zimbabwe’s Price also collected 29 international victories in a professional career that began in South Africa in 1977. After claiming the 1992 PGA Championship, Price enjoyed his best season in 1993, winning four times, highlighted by a five-stroke victory at THE PLAYERS Championship, and was named PGA TOUR Player of the Year. As an encore in 1994, Price enjoyed one of the most prolific seasons in TOUR history, winning six times, including the Open Championship and PGA Championship, en route to being named PGA TOUR Player of the Year for a second consecutive season and reaching No. 1 in the Official World Golf Ranking. Price, who was inducted into the World Golf Hall of Fame in 2003, has four Champions Tour victories to date. Price has the distinction of being the captain with the most Presidents Cup experience as a player. He competed for the International Team a total of five times (1994, 1996, 1998, 2000 and 2003) and compiled an 8-11-4 record in his Presidents Cup career. Since turning pro in 1994, Choi has amassed 20 professional tournament titles, including eight on the PGA TOUR. His win at THE PLAYERS Championship in 2011 is one of the many highlights, as are his previous Presidents Cup appearances in 2003, 2007 and 2011. He was a captain’s pick (by Gary Player) in 2003, becoming the first South Korean to compete in the event, and his overall record in The Presidents Cup stands at 6-8-0. On the strength of five top-25 finishes so far this season, Choi is currently ranked No. 19 in the International Team standings; the top 10 in September 2015 make the team automatically. Haas is a nine-time winner on the PGA TOUR and a 16-time winner on the Champions Tour, including two major championships. So far this season, he has finished in the top five in all but one of the 10 events in which he has competed and ranks third in the season-long race for the Charles Schwab Cup. Haas represented the United States in The Presidents Cup in 1994 and 2003, where he was a captain’s pick both times and compiled a 5-3-1 record. He served as Couples’ captain’s assistant for the winning U.S. Teams in 2009, 2011 and 2013. In 2011 and 2013, Haas’ son Bill competed on the U.S. Team. As U.S. Team captain in 2009, 2011 and 2013, Couples went undefeated and is the only captain to lead three Presidents Cup teams to victory. Couples owns 15 wins on the PGA TOUR, including the 1992 Masters Tournament and the 1984 and 1996 PLAYERS Championship, and was 1991 and 1992 PGA TOUR Player of the Year and Vardon Trophy winner. He was inducted into the World Golf Hall of Fame in May 2013. Since turning 50 in October 2009, Couples has accumulated 10 wins on the Champions Tour, including the 2011 Constellation Senior PLAYERS Championship, his first Champions Tour major, and, most recently, the 2014 Toshiba Classic. In addition to his four appearances on the U.S. Presidents Cup Team as a competitor (1994, 1996, 1998 and 2005) and three previous as captain, he competed on the U.S. Ryder Cup Team five times (1989, 1991, 1993, 1995, 1997). The 2015 Presidents Cup follows a string of recent international events to be played on Nicklaus Design courses. In October 2013, Jack Nicklaus-designed Muirfield Village Golf Club in Dublin, Ohio, outside of Columbus, became the only club in history to have hosted The Presidents Cup (2013), Ryder Cup (1987), and Solheim Cup (1998)—golf’s three most prestigious international team competitions. Muirfield Village set records for attendance and charitable dollars raised. In September, the Golden Bear’s design at the PGA Centenary Course at Gleneagles in Scotland will host this year’s Ryder Cup. No fewer than 110 Nicklaus Design courses have hosted a combined total of more than 750 professional tournaments or significant national amateur championships worldwide. The Presidents Cup, a team match play competition featuring 24 of the world’s top golfers—12 from the United States and 12 from around the world, excluding Europe—is held every two years, and since 1996 has alternated between United States and international venues. The Presidents Cup was developed to give the world’s best non-European players an opportunity to compete in international team match-play competition. The U.S. Team has won eight of the 10 previous Presidents Cups, and the only outright win by the International Team came at the 1998 event in Melbourne. A historic 17-17 tie came in 2003 when the event was held in South Africa. The Presidents Cup is a unique golf event in that there is no purse or prize money; instead, each player, captain and captain’s assistant allocates an equal portion of the funds generated to charities of his choice. Since the inception of The Presidents Cup in 1994, more than $32 million has been raised for charity from event proceeds, including more than $5 million from The Presidents Cup 2013. Over the past 20 years, The Presidents Cup has impacted more than 450 charities in 15 countries worldwide and 35 states in the U.S.
To read a transcript of the press conference where the Presidents Cup captains were announced, click here.